The ability to rapidly and objectively assess how well business processes are performing in relation to overall business goals, strategy and competition is crucial to reducing costs and increasing value. Travel Leaders never "takes its eye off the ball" and is continuously looking for opportunities to deliver incremental value to our clients and assist them in achieving their program objectives and goal. Benchmarking is a technique used by more and more organizations who want to evaluate processes in relation to best practices and develop plans for adopting these practices. Benchmarking is done on a continuous basis so an organization can challenge their own practices with the goal of increasing specific areas of performance. You may already know that travel and entertainment are some of the most controllable expenses in your company, but did you know that decreasing indirect spend like travel and entertainment by as little as five percent has the same impact on your bottom line as a thirty percent increase in sales? * Traveling is vital to your company's success, so you can't just cut travel expenses haphazardly, you need to know exactly what to cut and where. That's where Travel Leaders' expertise can provide significant value to your company. Through our partnership with Travel GPA we help companies save money on their travel spend. How? With more than 90 benchmarking metrics available for analysis, Travel GPA identifies your organization's key metrics that can be clearly tied to performance and graded good or bad. With the Travel GPA Report Card™, you can easily track how well your travelers are utilizing the contracts your company has for airlines, car rentals and hotels. And of course, Travel GPA is easy to use - with a customized dashboard that works the way you want it to. Since it's a web-based product, you won't have to involve your IT team. With Travel GPA, you know immediately how your travel program rates... the higher your GPA, the better you're doing. The lower the GPA, the more opportunity you have to save money. Travel GPA allows you to see how you compare with real-time benchmarking comparisons on hundreds of key performance indicators against the best practice levels seen in over 40,000 companies. 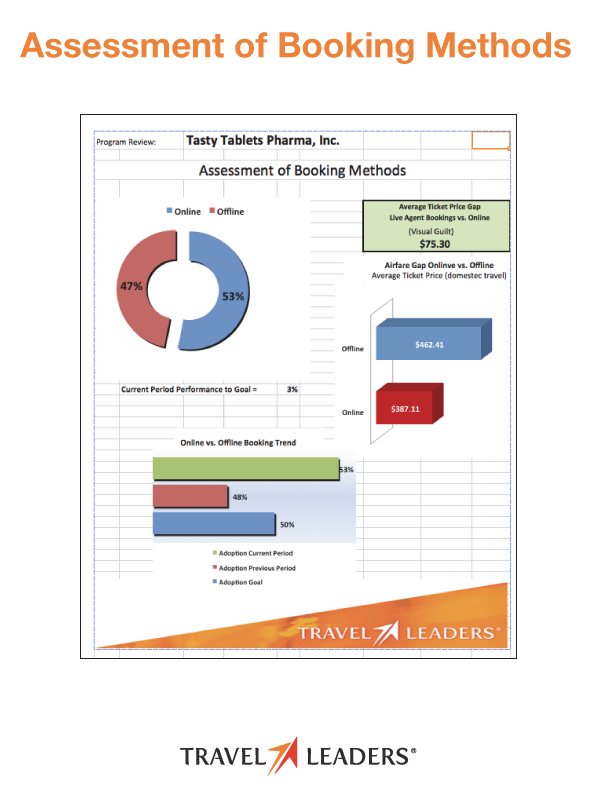 As the first product to provide real-time travel policy and benchmarking analysis on your corporate travel spend, it's no wonder companies across the globe are taking control of their bottom line with Travel GPA. For faster, more meaningful travel data that actually helps your bottom line, there's only one Travel GPA. Nothing is static in business travel management. As your partner in managing your travel spend, it's crucial that Travel Leaders continuously provides you with expert advice and guidance on how to keep your program "best in class". 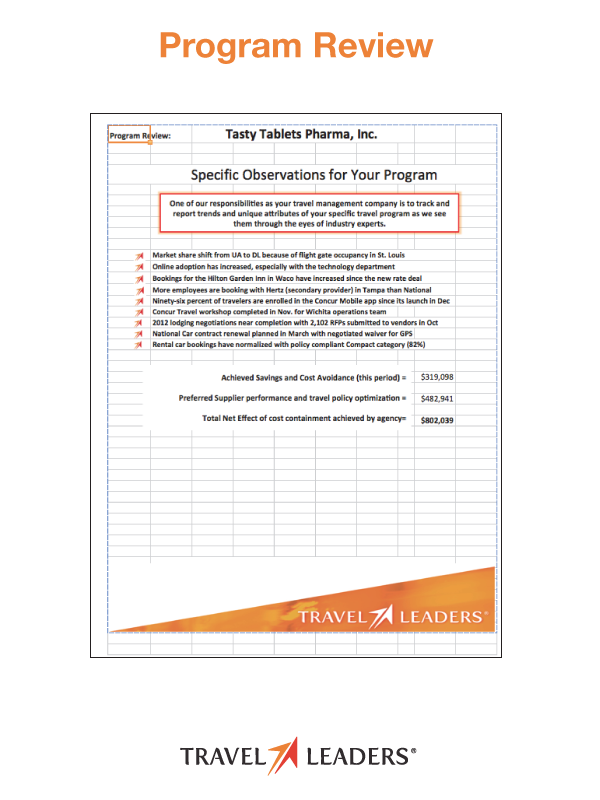 On a regular basis, Travel Leaders will provide you with your customized "Review Scorecard," based on our observations on your past performance and our recommendations for future enhancements to your program. It is their process of continuous review, analysis and planning that are imperative to keeping a program adapting to external market forces and moving forward to achieve your program goals. This is yet another example of the Travel Leaders difference - a Business Travel Management company vested in and working with you to achieve your program's goals.